The time is almost here! Delicious turkey will need carving, stuffing and cranberries will sit on your table, just asking to be eaten. Your loved ones, near and maybe even far, will join you to celebrate the wonderful holiday. You can fill your house for Thanksgiving with loved ones, delicious food, and beautiful décor that captures the holiday spirit. Your guests will feel right at home with warming décor. When planning a holiday feast, getting your home ready for guests, and still living your daily life, it can be hard to put together beautiful Thanksgiving décor, and have it be creative. The holiday deserves creative décor, especially to welcome your closest loved ones. Produce the produce. When you imagine putting together the perfect Thanksgiving décor, you may not think to hit the produce aisle in your local grocery store. Although it may be odd, it surely is gorgeous. You can take all your favorite seasonal fruits and vegetables, and create a floral work of art. Combining produce, such as pumpkins, squash, winter cabbage, grapes, and even apples, with gorgeous Fall blooms, can create a floral masterpiece that will have nature envious. Embrace color. The season of Fall is well known for its gorgeous colors! Thanksgiving is such a wonderful time of year and can be celebrated with gorgeous colors. The brighter the colors, the more eyes you will catch. There are well-known colors for Fall, but there is no law that says you can only use those colors for your Thanksgiving décor. Do not be afraid to go bright and beautiful, with any color of the rainbow shining through your gorgeous blooms, such as purple, for example. Contain it. As you peruse the store, looking for those perfect flowers, or floral inspiration, it is likely that you will see gorgeous flowers and other elements, standing tall as they bloom out of the container. You can take a different approach, however, and keep your flower contained in the actual container. 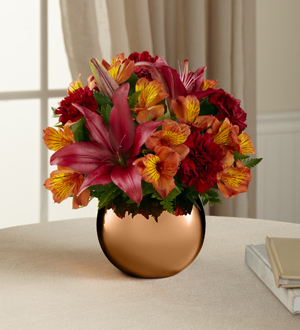 You can take big and beautiful blooms, place them in a short, bowl or cylinder, fill the bowl with water, but only enough to cover the short stem, and then you are left with a gorgeous floral piece that will not block your view of the loved ones across the table. 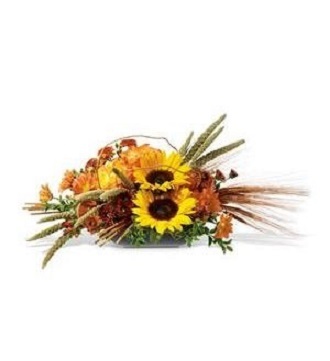 You can surely give your guests something to be thankful for with a trendy, creative, and inspiring floral masterpiece, perfect for your Thanksgiving dinner. Here at Texas Blooms & Gifts, we offer many gorgeous blooms that you can use to create your very own Thanksgiving décor masterpiece. If you are ready to start planning your Thanksgiving vision, be sure to contact us today. 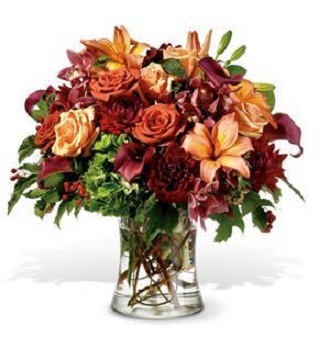 This entry was posted in fall flowers, flowers, holiday flowers and tagged #fall, Texas Blooms, Thanksgiving Flowers. Bookmark the permalink.